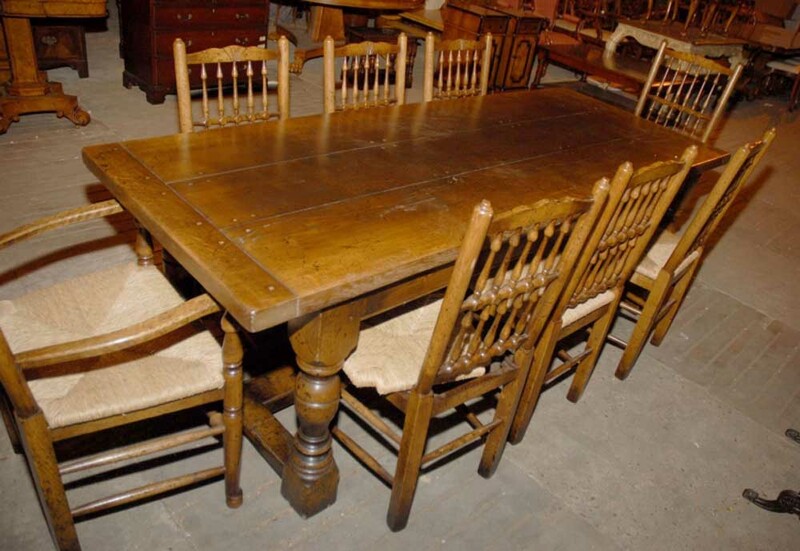 You are viewing an oustanding English rustic refectory table and matching set of 8 spindleback chairs in oak. I hope the photos do this set some justice, it’s certainly better in the flesh. Eating together whether with family or friends is perhaps the most important occasion, so why not do it in total style? We appreciate it’s quite an investment to lay out for the table and chairs but this will last for generations, making it a great heirloom and hence investment. The table and tables match and would make for a great dining set – they are good enough for a main dining table piece and also great for a kitchen set up, especially if you like the farmhouse, rustic look. The table has been hand crafted from the finest oak and is solid and chunky with no wobbles. The legs are hand turned and very chunky linking the stretchers to the bottom. The oak has a lovely patina to it, you can really see the quality to the grain of the wood, matched perfectly to the benches. The price is for both chair AND tables. If you wanted we could sell you just the chairs or the tables. Please email for further information. We will ship these to anywhere in the world. We bought these from a dealer in Debenham, Suffolk whilst on a recent East Anglian buying trip. Then of corse we have the set of 8 English oak spindle back chairs consisting of two arm chairs and six side chairs. They are the ultimate dining chair and have the flexibility to also suit the kitchen. I have a similar set in my dining room at home of which I have included a picture to give you an idea of how they look. They are hand woven rush seats too so they are very comfortable to sit on. They are very comforable and sturdy and are perfect for the everyday rigours of family life, withstanding the knocks of small children whilst taking the weight of adults for Christmas and Thanksgiving dinners. This set have just come back from the restorers where they had a repolish and the seats were re-woven with rush. The grain of the oak has a lovely finnish to it and the repolish has really accenuated the beautiful grain and burl of the wood – they have really come up a treat and are ready for use in your home immediately. The stretchers are lovely hand turned. The chairs are named spindle backs for obvious reasons and each one of the spindles would be hand turned so you can see the amount of time and craftmanship that has gone into the making of each individual chair. These will last for a long time and can be passed down from generation to generation and thus are a sound investmant.